To ensure that all delays in the modernisation of the armed forces are eliminated and that all funds earmarked for modernisation are spent fully at the earliest. More specialist battalions will be raised and positioned in key locations across the country. To set up a new Department of Ex-Servicemen’s Welfare in the Ministry of Defence. The long-pending issue of one-rank, one-pension will be re-examined. To maintain a credible nuclear weapons programme while at the same time it will evolve demonstrable and verifiable confidence-building measures with its nuclear neighbours. It will take a leadership role in promoting universal, nuclear disarmament and working for a nuclear weapons-free world. To ensure that strictest possible action without fear or favour, against all those individuals and organisations who spread social discord, disturb social amity and propagate religious bigotry and communal hatred. The law of the land will be enforced effectively. Citizenship is a right and a matter of pride. With the huge IT expertise available in our country, it is possible to provide every Indian with a unique identity card after the publication of the national population register in the year 2011. Pledge to make India’s defence forces technology-enabled and equipped with modern weapons, aircraft, ships and delivery systems to repel any threat from land, sea or air. Recognizing their special concerns, a new and separate department of ex-servicemen’s welfare was established in 2004 by the Congress-led UPA Government. Ex-servicemen constitute a large cadre of dedicated and trained persons. We will utilize them extensively in crucial nation-building tasks. Accountability of the police force will be institutionalized. India has strengthened its participation in multilateral institutions and deepened its strategic partnerships with various countries so as to effectively contribute, as a responsible stakeholder, to regional and global peace and stability. The UPA Government has placed special emphasis on enhancing defence preparedness and upgrading the capabilities of the Armed Forces to meet security challenges. A new Defence Production Policy was drawn up, with the objective of achieving self reliance in defence production. FDI upto 26 % is permitted in Defence sector, subject to FIPB approval. The Government’s approach is to deal with left wing extremism in a holistic manner, in the areas of security, development, ensuring rights of local communities, good governance and public perception. 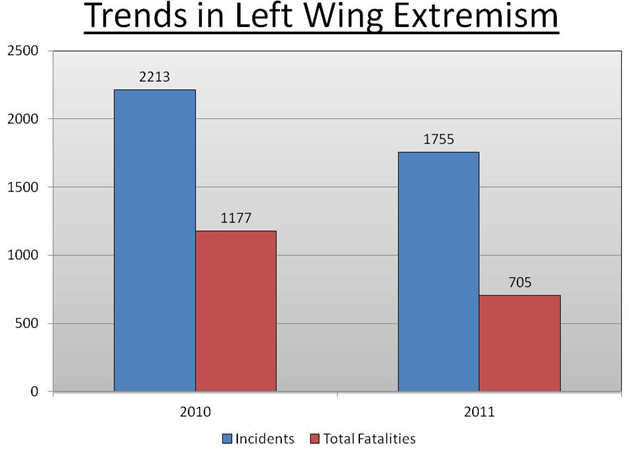 State governments deal with various issues related to the activities of left wing extremists in States. The Central government supplements their efforts through a wide range of schemes. 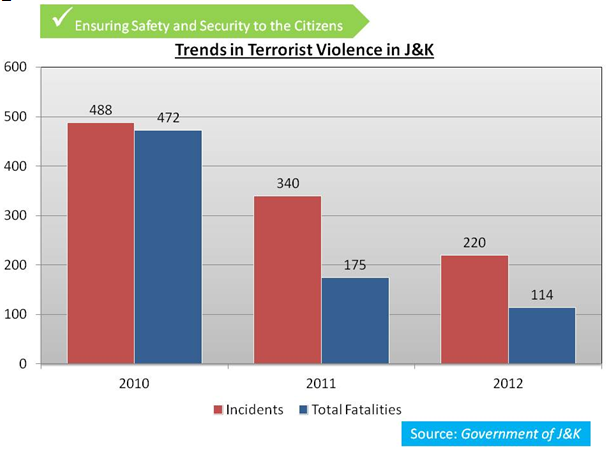 • The Internal Security situation in the country showed distinct signs of improvement over the previous years. 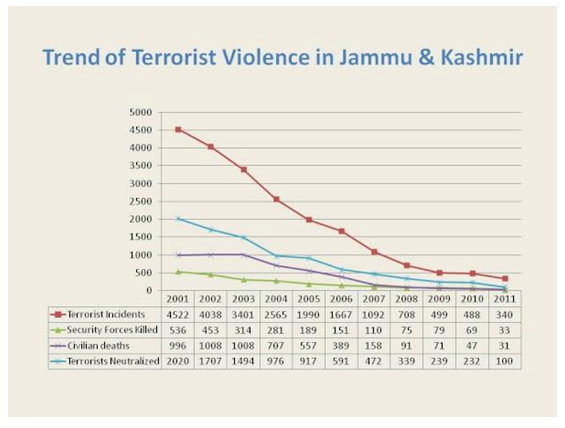 • Implementation of the Integrated Action Plan in 78 Left Wing Extremist (LWE) affected districts for providing public infrastructure and services in select tribal and backward districts most of which are affected by left wing extremism. • In order to give a push to development works in areas affected by left wing extremism, Government approved formation of 10 new Specialized India ReserveBattalions and conversion of 3 previously sanctioned India Reserve Battalions into specialized India Reserve Battalions. • These Battalions have both security as well as engineering formations to remove any hindrance in executing developmental works. • The Government signed a tripartite agreement for setting up of the Gorkhaland Territorial Administration. • The gradual improvement in the security situation in North-East and bonding with the people of that area is important for emotional integration in the long term security interests of the country. • Land for setting up of the headquarters of the National Intelligence Grid in Delhi has already been acquired. • NATGRID will in due course link various databases in the country for constructing actionable intelligence to combat terrorism and internal security threats. • The total length of the Indo-Bangladesh border sanctioned to been fenced is 3,436.59 km. ; out of which 2760.12 km. of fencing has so far been completed as of March 2012. • Until March 2012- 3,605 km of border roads and 1,292 km of floodlighting have been completed along the Indo-Bangladesh border. • More than Rs. 990 crore has been allocated for Border Area Development Plan for the year 2012-13, The BADP covers 358 blocks of 96 border districts of 17 States located along the international Land Border. • To facilitate trans-border movement of goods and people, 13 integrated checkposts are being set up at designated entry points on the international land borders of the country, at an estimated cost of Rs 635 crore. • In the first phase, construction of 7 integrated check-posts has been taken up, viz., Attari (India-Pakistan), Raxaul (India- Nepal), Jogbani (India-Nepal), Dawki (India-Bangladesh), Akhaura (India-Bangladesh), Moreh (India-Myanmar) and Petrapole (India-Bangladesh). • 5 NSG Regional Hubs Established in Manesar, Kolkata, Hyderabad, Chennai and Mumbai. One at Gandhinagar approved. • India has strengthened its participation in multilateral institutions and deepened its strategic partnerships with various countries so as to effectively contribute, as a responsible stakeholder, to regional and global peace and stability. 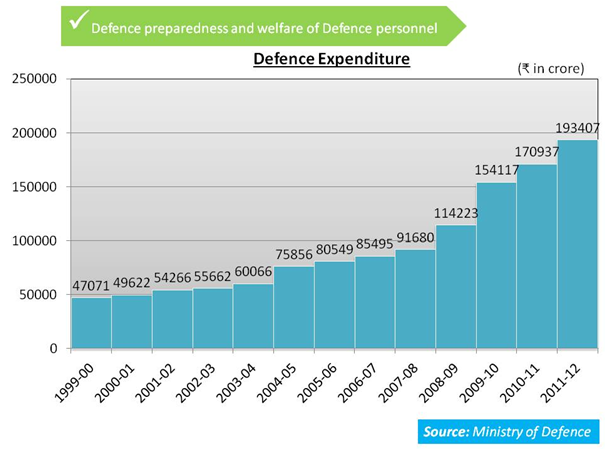 • The UPA Government has placed special emphasis on enhancing defence preparedness and upgrading the capabilities of the Armed Forces to meet security challenges. • A new Defence Production Policy was drawn up, with the objective of achieving self reliance in defence production. • FDI upto 26 % is permitted in Defence sector, subject to FIPB approval. • The UPA Government has taken several steps to promote the modernization of our armed forces and ensure defence preparedness of the country. 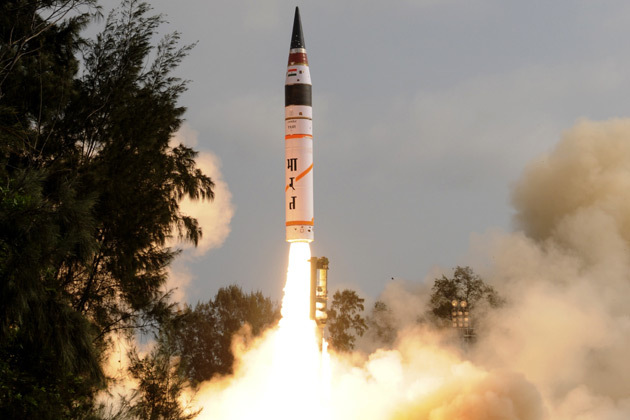 • The successful launch of Agni-III Missile and the induction of BrahMos Missile System into our armed forces constitute major milestones in the upgrade of our defence technology. • Akash surface to air missile system capable of multi-target handling, is also being inducted. • The modernisation of Rashtriya Rifles underway to improve the counter insurgency grid in Jammu & Kashmir. • Two regiments of the indigenous Main Battle Tank (MBT) – Arjun were operationalised by the Army. • The indigenously designed and developed Light Combat Aircraft (LCA) – Tejas, which is the smallest light weight, multi-role combat aircraft in the world, was cleared for operations by the Air Force. 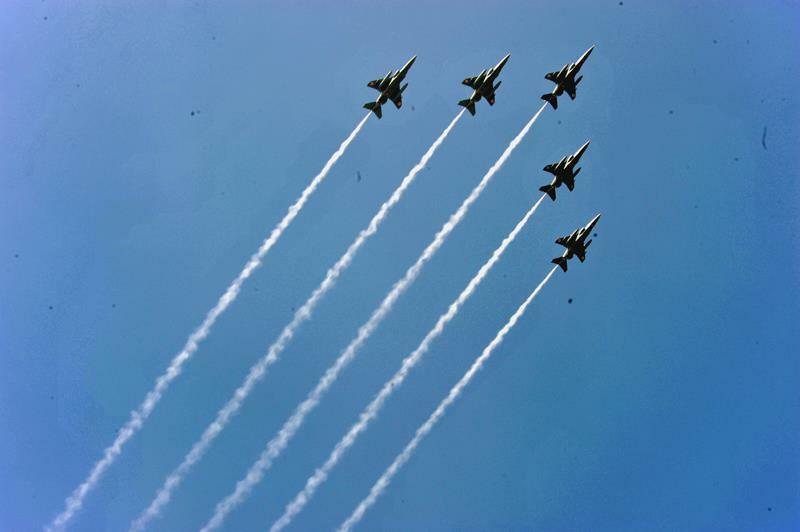 •The Air Force has also successfully inducted the Airborne Warning and Control System(AWACS). • To provide the desired offensive capabilities to Mechanised Infantry, the Army is well on its way to undertake an ambitious programme to modernise the entire fleet of BMPs. • The first fully modified aircraft for the indigenously developed Indian Airborne Early Warning and Control System took to the skies in December 2011. • Procurement of a modern, state of the art Anti Tank Guided Missile is also under process. • The First indigenously designed and built stealth frigate, INS Shivalik was commissioned. India’s first pollution control vessel ‘Samudra Prahari’ was also commissioned. • The nuclear-powered attack submarine INS Chakra was inducted into the Indian Navy on April 4, 2012. • 48 ships and submarines presently on order, 44 are being built in Indian shipyards. • In consonance with the Indian Navy’s commitment towards antipiracy operations in the Gulf of Aden, the IN has deployed one warship continuously in the area from October, 2008. • An integrated and synergetic approach has been adopted byinvolving the Indian Navy, Coast Guard,Intelligence, Custom, State Marine Police, and other central and state agencies in meeting this challenge. • The second indigenously designed and built stealth frigate of the Shivalik class, INS Satpura was commissioned on August 20, 2011.